Fat, sugar and salt are deemed chemicals non grata by many a health organization. However, it does not prevent most people from consuming foods rich in added sugar, which contributes to development of a variety of diseases. Toddlers are affected too: either willingly or not, they consume too much added sugar from sources, which may look healthy but be piles of sweet compounds in disguise. What’s on your child’s menu? 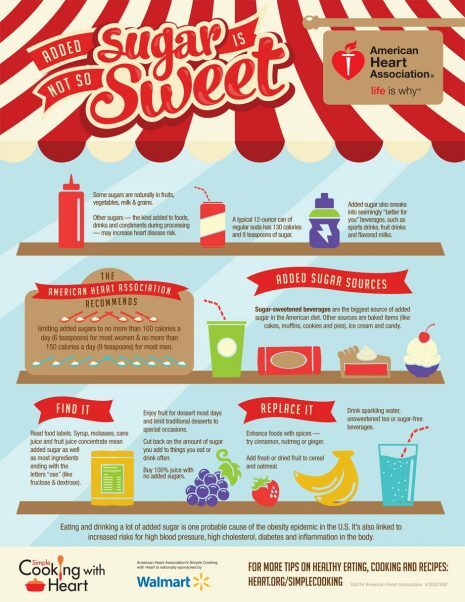 Do you follow the guidelines issued by the American Heart Association, which says you should avoid candies, power bars, cereals that do not require cooking, pastry, drinks containing sugar, and even yogurts? Yes, that’s right – even foods that are generally considered healthy can harbor a lot of sugar. A team of scientists from the Centers for Disease Control has recently reported that many parents of toddlers, i.e. children below the age of 2, fail to follow the advice given by nutrition and healthcare specialists. Are you among them? The researchers surveyed parents of eight hundred children from Maryland. The toddlers were aged six to twenty-three months. Having asked the parents how much added sugar their children consumed within the last twenty-four hours, they came to the conclusion that the intake was much higher than recommended. Another curious finding is that the older the toddler, the more sugar is introduced into their menu. In the group of children aged 6-11 months, the share of children consuming added sugar made up 61%. However, in the group of 1-2 year-olds the amount increased to a whopping 98-99%. The mean consumption for all toddlers was 4.2 tablespoons a day. The intake varied from 0.9 tablespoonfuls to 7.1 tablespoonfuls. They also noted that except for the children aged 6-11 months, non-Hispanic Afro-Americans ate more sugar than whites. The intake of added sugar does not seem to depend on gender. Many parents feed their children foods that look healthy – and may actually contain quite a lot of nutrients – but are stuffed with sugar. Among these are yogurts, as one serving can have up to 6 tbsp in it, especially if there is a layer jam or fruit. If you want a healthier option, you can pick Greek yogurt, for instance. Choose yogurts with no extra sugar and no additives. Dried fruits, which are definitely rich in vitamins, contain impressive amounts of sugar: one cup harbors up to 21 tbsp! That’s a lot of sugar. Sauces are no exception: ketchup usually has as much as 1 teaspoon per each tablespoon. As a healthy alternative, make your own ketchup using tomatoes, herbs and olive oil. Instead of added sugars, feed your child more vegetables and fruit. Eating sugar in excess is associated with a wide range of health problems. From obesity to cavities to heart disease, nearly every system of the human body appears to be prone to damage dealt by sugars. Sugars are contained in natural foods, like fruit and vegetables, and it is them that should be preferred over artificial sweeteners or common sugar added to yogurts and juice, which is another drink often given to children. Another reason to limit the amount of sugar consumed by your child is that the first two years are the period when food preferences are starting to shape, and if they are moved towards sweets and soda, chances are the poor nutrition pattern will extend to adulthood.